If you're thinking about checking out NAPC, we hope you'll come visit us in person! Here's a few things to help you get to know us. We're located at the corner of Peachtree Street & North Avenue, just one block south of the Fox Theater. We have free parking on site in our adjacent parking deck, which is accessible from Peachtree Street or Courtland Street. How do I get in the building? On Sundays, there are several entrances open. You are welcome to enter through the main Sanctuary doors located on Peachtree Street. 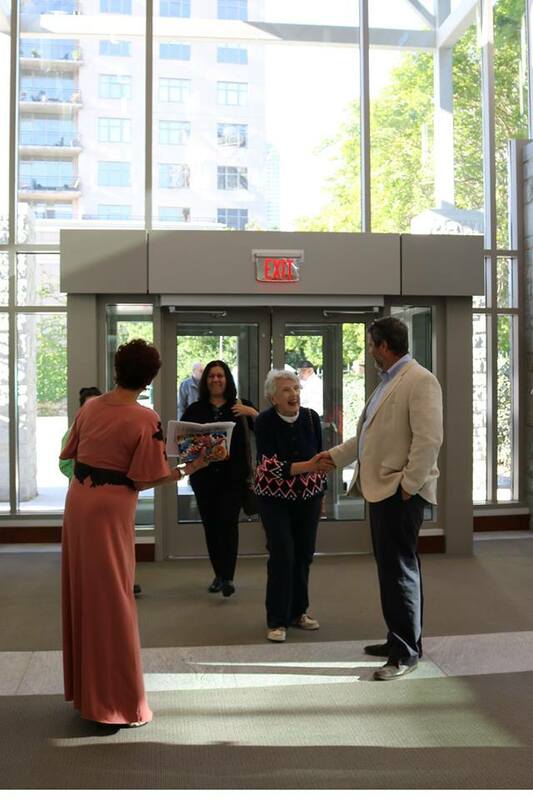 You may also enter through our Hospitality Hall entrance (double glass doors, just off Peachtree Street on our upper parking deck) and grab a cup of coffee and say hello or ask questions before heading into worship in the Sanctuary. If you are entering during regular business hours during the week, if you drove, please park on our lower desk and enter through the double glass doors to the left of the children’s ministry entrance (you can’t miss the neon lights). If you are walking, you may enter through the Hospitality Hall double-glass doors located off our upper parking deck (just off Peachtree Street). For either entrance, please press the intercom button. Our receptionist will buzz you in, then press the handicap accessible button, and the doors will open. North Avenue is a diverse community that is home to members of all ages from more than 30 countries. We are committed to loving and caring for one another as we grow in our faith. An urban church in the heart of Atlanta, North Avenue has been worshiping on the corner on North Avenue and Peachtree Street since 1898. Our vision is to know Jesus and make Him known. We are committed to the faithful preaching and teaching of the scriptures and to expressing our faith through concrete acts of compassion and justice in the city and throughout the world. We have families that have been a part of NAPC for generations—since the founding of the church, and new people who worship with us every Sunday! Read more about our core beliefs here. | Learn more about our ministries here. | Get to know our staff here. All three of our weekly worship services take place in the historic NAPC sanctuary. Our worship bands leads contemporary songs of praise. Scripture and the sermon ground this service. We often conclude with an open-mic time for prayer requests as we pray for and with one another. Comfortable dress is typical attire. The NAPC Chancel Choir lead our music with organ or piano accompaniment, often familiar hymns. Scripture and the sermon ground this service. This service usually has more liturgy incorporated like a Prayer of Confession, Prayers of the People, and the Apostle's Creed. Many (but not all) wear more formal attire to this service. This smaller gathering offers a more intimate service. We are led by our worship band. The worship service is centered around scripture and the sermon. We celebrate Holy Communion every week. Come as you are! We celebrate Holy Communion on the first Sundays of the month, sometimes by intinction, and quarterly by trays in our traditional service. Often our sermons are part of a sermon series. You can listen to previous series here. It is our joy to love your kids! On Sundays, we have care for children ages 8-weeks through Preschool from 9 a.m. to 12 p.m. in The Sphere, located on the second floor. During the 10 a.m. hour, all of kids (8-weeks through 5th grade) have a discipleship hour where their teachers explore the Bible and faith with them in engaging ways. During the summer, our preschool children get to take part in Preschool Worship together. Youth (middle and high school) meet at 10:15 a.m. for discipleship as we begin to develop close relationships with Jesus. We meet in The Underground on the first floor. During the academic year, youth group also meets on Sunday nights for a meal, games, and Bible Study as we build community together—a place to be loved and belong. Both our Children and Youth ministries opened new, beautiful, engaging spaces as part of our recent SHINE Building Campaign. We hope you'll come check it out! Read more about our Children & Family Ministries here. If you're looking for a place to connect with other people, we hope you'll explore some great small group environments. You can also email Kim Goldsmith to help find the right fit for you or to ask questions about NAPC!